To understand what's going on, we have to start with land. All productive land removes CO2 from the atmosphere. When I say productive, I mean that in an ecological sense. Any land that has something growing on it is ecologically productive whether or not it is commercially productive for crops, grazing or forest products. The rate of carbon uptake depends only on what's growing on the land, not what becomes of the harvest. Thus, a corn field removes CO2 from the air at the same rate regardless of whether the corn is used for food or for fuel. 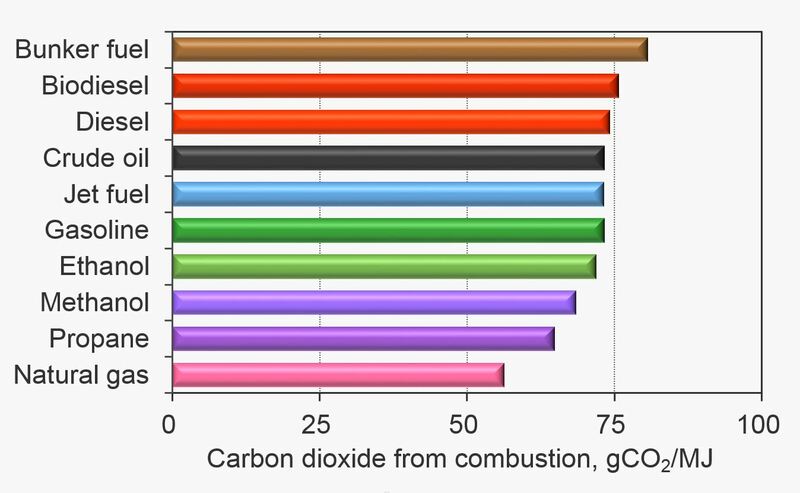 CO2 emissions per unit of energy vary little among similar fuels. Let's next look at motor fuels. Whenever we burn a fuel in an engine, it emits carbon dioxide. 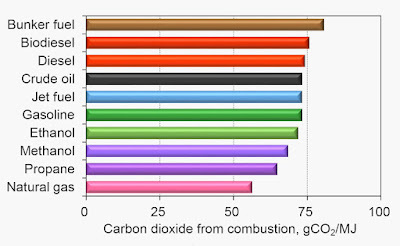 CO2 emissions are quite similar for similar fuels. Ethanol emits about 2% less CO2 than gasoline; diesel and biodiesel both emit a bit more than gasoline. And so, when looking at CO2 flows in and out of the air, there is no appreciable difference in CO2 emissions when we burn ethanol instead of gasoline. No more CO2 is removed on land when we use corn to make ethanol instead of food. So, to a first approximation, biofuel use isn't carbon neutral at all. Even if less petroleum is used, that does not necessarily translate to less CO2 emissions. Any potential benefit requires speeding up the rate at which CO2 is removed from the air. That is to say, there must be an additional gain in carbon uptake. If one just re-purposes a harvest from food to fuel, there is no environmental benefit but there are many disbenefits such as higher grain costs as well as other forms of environmental harm. Moreover, people still need to eat. The corn and soybeans diverted to fuel have to be made up by growing more crops somewhere else. That leads to land conversion and very large carbon releases. Our recent study quantified the rate of CO2 removal by U.S. cropland from 2005 to 2013 and compared it to the amount of CO2 emitted when biofuels are burned. The following diagram provides a schematic of the analysis. It shows the cropland, motor vehicles and fuel processing, which also releases emissions. The dashed boundary encloses the vehicle-fuel system that we need to evaluate. This diagram also shows that carbon leaves the system in the form of food and feed not used for fuel, and that fossil carbon enters the system from petroleum resources. This form of analysis rigorously accounts for all of the carbon leaving and entering the system, which is something that the lifecycle computer models fail to do because they do not consistently track carbon uptake even though they track the processing emissions. From 2005 to 2013, U.S. biofuel use rose from 4 to 15 billion gallons, displacing an energy-equivalent amount of petroleum. 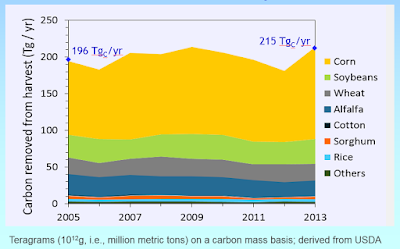 Over the same period, carbon uptake on cropland increased from 196 teragrams per year (TgC/yr; same as a million metric tons) to 215 TgC/yr in 2013. As shown in the chart below, this gain in uptake was largely a result of more corn being grown. To quantify the net effect on CO2 emissions, we need to tally the cumulative carbon flows directly related to substituting biofuels for petroleum fuels. 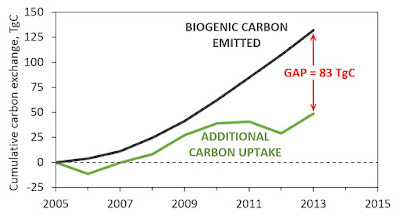 The next chart shows the amount of fossil carbon replaced by biofuel carbon, termed "biogenic" carbon, shown as the steadily rising black curve. The question is, how much of the biogenic carbon is neutralized by additional carbon uptake on cropland? The cumulative increase in cropland carbon uptake is shown by the green curve. It does not rise steadily; there are up years and down years, such as the drought related drop in 2012, although it trends upward overall consistently with the rise in the annual rate of carbon uptake shown above. 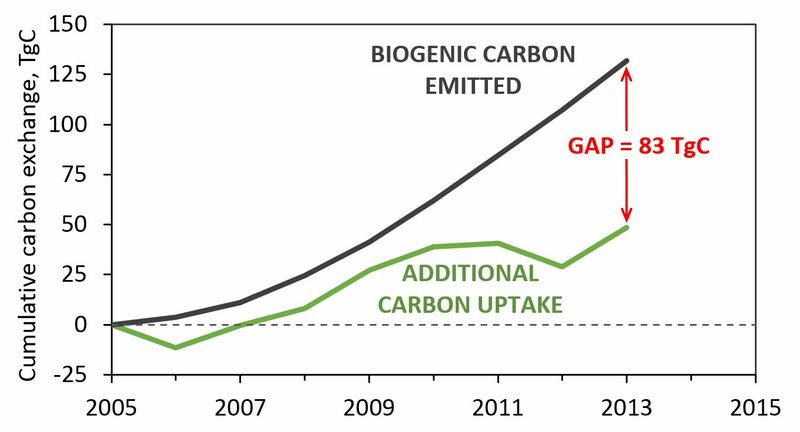 Nevertheless, the gain in carbon uptake falls well short of the increase in biogenic CO2 emissions. As shown on the chart, there is a gap of 83 teragrams by 2013. Comparing this shortfall in carbon uptake on cropland with the cumulative biogenic CO2 emissions shows that, over this period, biofuel use was only 37% carbon neutral instead of 100%. 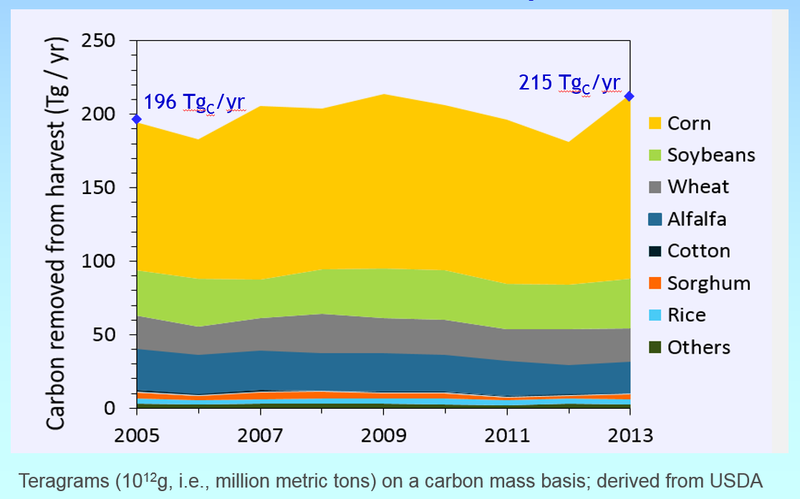 This gain in carbon uptake was not enough to neutralize the CO2 emissions from fuel use. Therefore, even though less petroleum was used, the quantity of fossil fuel displaced by biofuel did not fully translate to a net emissions reduction because the biofuel use still emits CO2. The table below shows what happens when we add in other effects. Without a 100% offset of biogenic emissions to balance out the emissions due to fuel processing and land conversion, these effects overwhelm the partial offset that did occur. The partial, 37% offset is reflected in the -38 teragram number shown first in this table. That emission reduction is nearly undone by the 36 teragrams due to cropland expansion based on Lark et al (2015), which doesn't even reflect carbon losses over the full 2005-2013 period. What really pushes things over the top, however, is the huge release from international land-use change, i.e., greater tropical deforestation. The 433 teragram value is taken from EPA's analysis. Such values are highly uncertain because they depend on global modeling, but sensitivity analysis has shown that they are more likely to be much larger than they are to be much smaller. In any case, it's quite clear that biofuel use has made overall CO2 emissions much higher than they would otherwise be. That's not to say that the way we now use petroleum is OK. It's not; oil is the nation's largest source of CO2 emissions and the second largest world-wide. Addressing those emissions is an urgent need, but the solutions need to be real. In addition to improving vehicle efficiency, the other key step is offsetting tailpipe CO2 emissions through carbon sequestration. Although a correct carbon balance analysis is bad news for biofuels, the principles behind it point the way toward what to do instead. The key insight is that what mitigates emissions is increasing carbon uptake on land. There are many ways to do this that don't involve turning biomass into fuel and burning it. 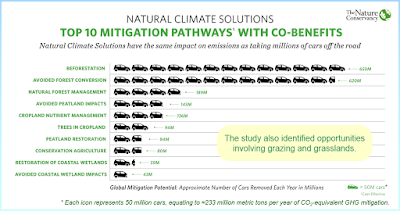 An excellent overview of such options is given in a recent paper on Natural Climate Solutions led by scientists at The Nature Conservancy (Griscom et al 2017). Their study quantified ways to sequester carbon in the biosphere that, if pursued globally, could offset a large portion of excess CO2 emissions. A number of the opportunities involve pasture and grasslands as well as reforestation; although grassland options are not featured as prominently as forest options in the Griscom et al study, other literature suggests that they can be quite substantial as well. If the full set of natural climate solutions were pursued with determination, they could provide a large share of the CO2 reductions needed over the next two decades for getting the world on track to hold global warming to less than 2°C. 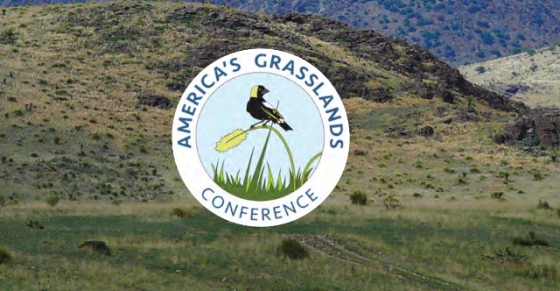 Such actions entail managing carbon on land, something that many of you do as part of your grassland conservation efforts. In fact, managing carbon on land is a prerequisite for biofuels to one day be sustainable. But promoting biofuels today is putting the cart before the horse. We have to start with increasing carbon uptake on land, which is the foundation for any form of bio-based climate mitigation. Biofuels are not automatically carbon neutral; in other words, one can't just assume that biofuels recycle carbon. The models used for renewable fuel policies build in this invalid assumption, leading to flawed claims that biofuels are beneficial. Correct carbon accounting shows that the expansion of biofuel use has made CO2 emissions worse. This added damage to the climate compounds the other environmental and economic harms caused by the policy. Instead of pursuing biofuels, we should be protecting and restoring ecosystems that store carbon, including grasslands and forests. Using productive land to make fuel is a mistake. Much more needs to be done to educate Americans and policymakers about the value of sequestering carbon in our landscapes and to correct the false positive impression of biofuels that has tragically taken hold in energy policy. DeCicco, J.M., et al. 2016. Carbon balance effects of U.S. biofuel production and use. Climatic Change 138(3): 667-80. Griscom, B.W., el al. 2017. 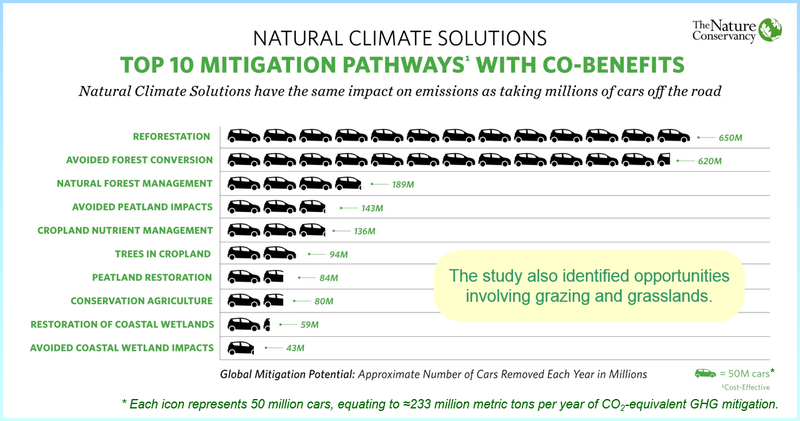 Natural climate solutions. Proc Nat Acad Sci (PNAS) 114(44): 11645-50. Lark, T. J., et al. 2015. Cropland expansion outpaces agricultural and biofuel policies in the United States. Environ Res Lett 10:044003. Download the presentation slides here [PDF].